We frequently consult with the public, and one such event involved children (and their families and teachers) from Leeds schools. We started by contacting about thirty schools that are physically closest to the proposed Kirkstall Valley Park. We favour “Planning for Real” ® exercises, which involve several public meetings in each locality where people can comment on the scheme and suggest alternatives. 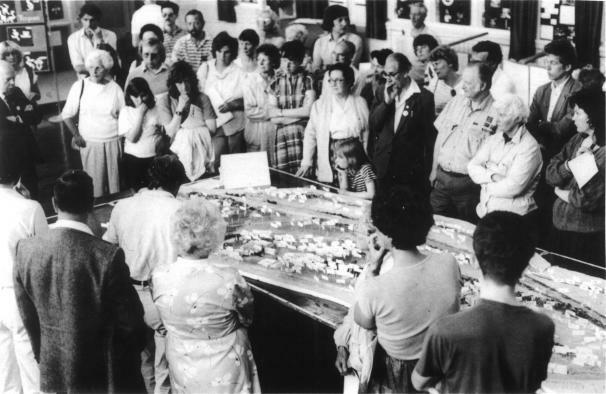 An important part of our Planning for Real has been a large three dimensional model of the site, big enough for crowds of visitors to walk around and discuss alternatives. School pupils and students helped us to construct this model, and to suggest things that might be included. Local residents have organised similar events in the Kirkstall Valley for over twenty years and these have been very successful method for people to express their views. Previous participants helped with more recent projects, and we had a tutor from the Neighbourhood Initiatives Foundation who explained how the process is conducted. Click each title to load a larger image. We used a grant from the Local Network Fund (via the Community Foundation for Calderdale) to pay for the materials, so that it did not eat into school capitation allowances! We supplied detailed large scale maps and aerial photographs, lightweight board, paints and modelling materials. The project is closely aligned to the National Curriculum. 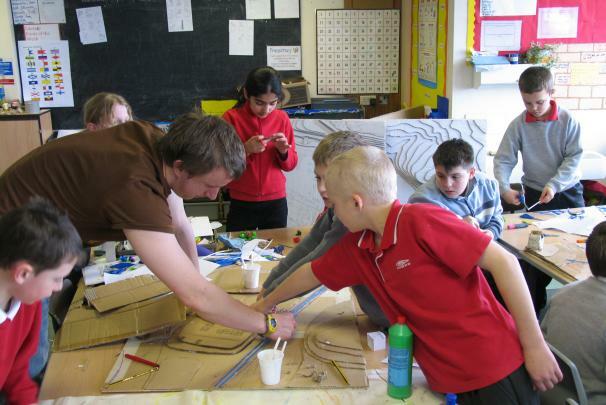 The basic idea was to cut and stack the boards along the contour lines to make the three-dimensional outline, then fill and paint the surface to show footpaths, roads, rivers, canals, railway lines and so forth. On this very large scale it is possible to see individual trees and houses, so it should be possible for every pupil in every school to contribute their own tiny piece to the finished model. 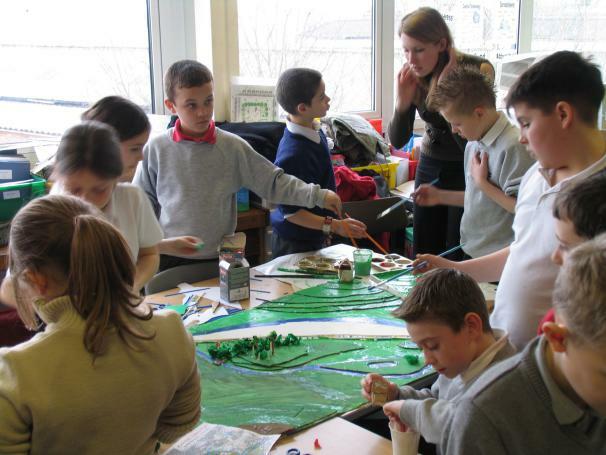 We divided the work between different schools, so that each school could do some work in their own locality, but all the models fit together to make the completed assembly. We provided an overall colour scheme and helped with the joins so that we didn't end up with a patchwork quilt. In addition to the collective effort to build the model, KVP offered small but appropriate prizes for individual or group excellence within each school and within each age group in areas such as creative writing, painting, history, dance, geography and science related to the Kirkstall Valley Park. Having done this once before, we knew fairly well what needs to happen. Public meetings start on a small scale in each locality, involving schools, churches, pubs, clubs and community groups and eventually culminate in one or more larger meetings when hopefully a consensus will emerge. There is no rush and the process will be spread over many months, so that everybody will have chance to take part. Careful preparation is the key, so that people come to the discussions knowing the issues and the practicalities. The involvement of individual pupils and their families is really helpful for this. We worked closely with the University of Leeds Access Academy and with Education Leeds. Future exercises will be supported by new curricular materials, historical and geographical notes that schools can adapt to suit their own pupils. All our volunteer and professional helpers are cleared for work with children and vulnerable adults and have recent CRB checks. Although our project is most closely related to local Geography and History, it includes elements of Citizenship, Science, Mathematics and the Creative Arts. We will produce a variety of new teaching and learning materials that will be suitable for students of different ages and spanning the whole ability range. We can provide speakers, videos and practical materials. We hope that many schools will contribute to this, and share their creativity with their neighbours. All our materials will be available electronically via the Leeds Learning Network, on CD/DVD and also via the Internet. Please discuss this proposal with your Chair of Governors / Head Teacher and respond to us if you would like to be involved, or if you need more information about the plans. Planning for Real is for everybody, but we also have a wide range of individual and group projects with varying degrees of difficulty that may be suitable for pupils studying for "A" levels or GCSE. For example, the Kirkstall Valley Park will need geophysical and ecological survey work, artwork and publicity, photography, local history research, population surveys, traffic counts, feasibility studies, business models, soil and water chemistry, statistical analyses. This should not be seen as an exhaustive list. Please make contact to discuss your specific requirements, because we might well be able to help.